As the dust settles on Worthy Farm after the latest edition of the world famous Glastonbury Festival it’s the perfect time to put the event under the microscope and take a look at some of the features that make it such a special gathering. There’s no doubt that for most people Glastonbury is the godfather of all modern-day music festivals, a behemoth that acts as a blueprint for events all over the world, a legendary get together that has not only set the bar for the presentation of music on the big stage but inspires others with its progressive ideals and liberal stance. After spending four days at this year’s incredible festival, the last one before it takes a break for a "fallow year," Everfest’s Marcus Barnes describes some of the special features that make it one in a million. 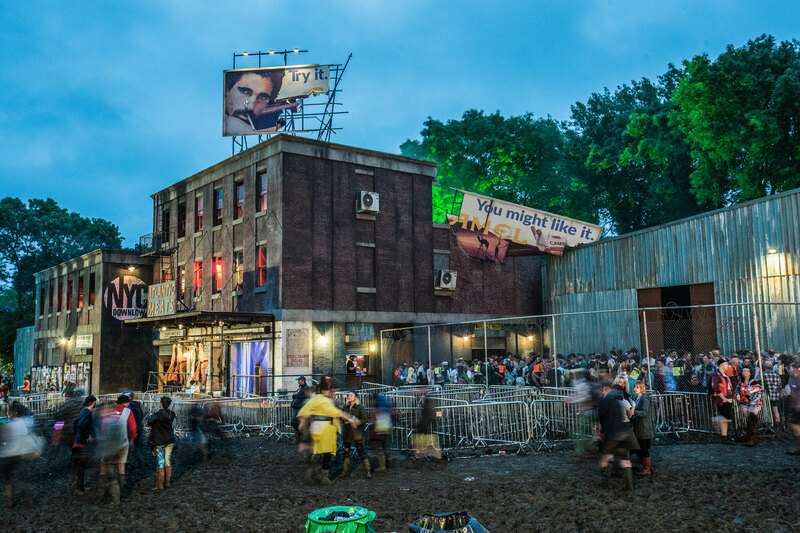 Located in the Block 9 district of Glastonbury, way over in the notorious south-east corner, where most of the really late night activity occurs, NYC Downlow has achieved legendary status thanks to its lascivious cast of freaks. In essence it’s a club, modelled on a naughty, clandestine queer space in the backstreets of a New York ghetto. But it’s so much more than that, for some it’s a lifestyle, a symbol of freedom of expression where anyone who’s anyone can mingle, let loose and enjoy house and disco of the highest quality. It’s the kind of place where you can spend hours on end enjoying the flamboyant runway shows, dancing the night away and having the time of your life with friends, new and old. Besides NYC Downlow, the entire Block9 area itself is very special and has a completely different look and feel to the rest of Glastonbury. In fact, everything in the south-east corner feels like a world away from the Pyramid Stage and indeed it is both geographically and aesthetically miles away from the main stages. When you walk into Block9 it feels almost dystopian. It’s gritty and raw, with music to match. Outside at Genosys most DJs play techno, likewise inside the main Block9 building, with disco and house at NYC Downlow. That otherworldly feeling enhances your experience, it’s liberating and encourages an open mind. 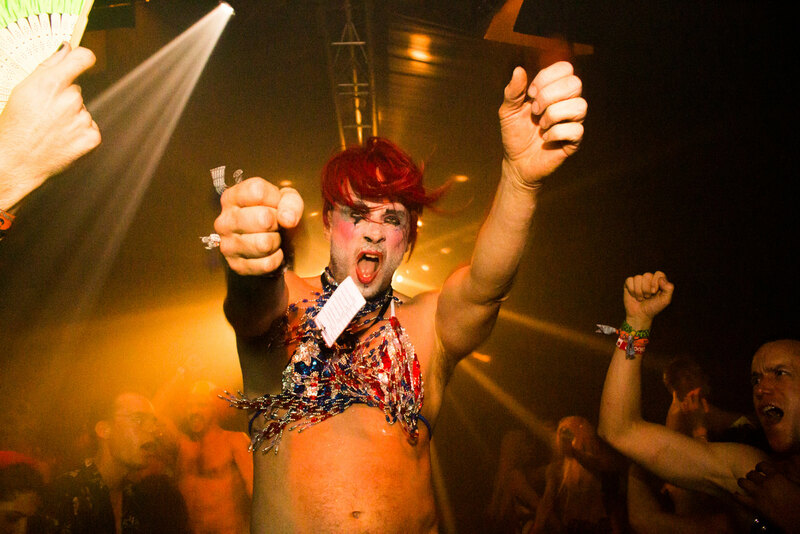 At Block9 you embrace the sociable atmosphere of Glastonbury, and lose yourself in a strange new world. Unbeknownst to most of those who visit Glastonbury, the festival has several backstage areas exclusively for workers. It’s an amazing alternative layer to the event, one of several layers that remain hidden from the majority of those who attend simply because they don’t have a connection to anyone who works there. To some this may sound a bit too ‘VIP’ or exclusive, far from it these are places where people who work at Glastonbury (bar staff, technicians, performers etc…) can go to let off some steam and relax away from the public. As anyone who works in hospitality will tell you, once you’ve clocked off the last thing you want to do is hang out with members of the public who you’ve been serving all night. 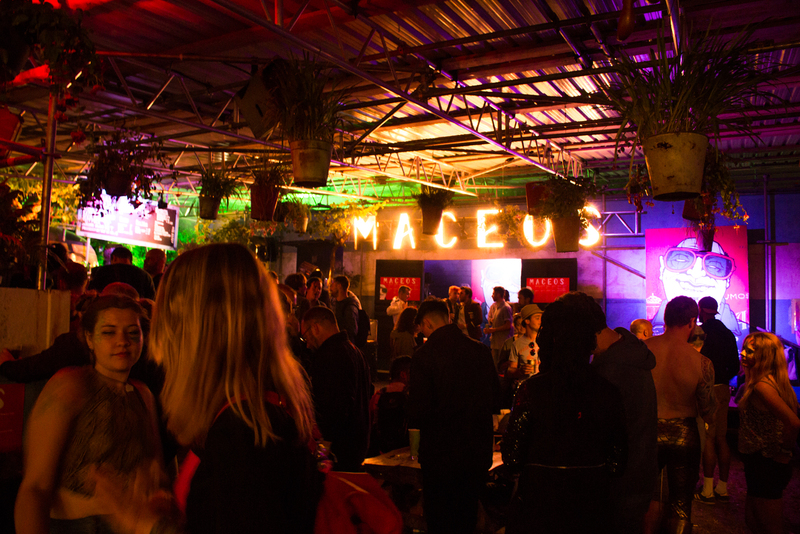 Maceo’s is one of the prime spots for workers, with the colourful performers from NYC Downlow among the assortment of characters in attendance at this 24-hour party venue. Guerilla Bar is another one; tiny little venue with a riotous bar, rowdy soundsystem and a crazy atmosphere. 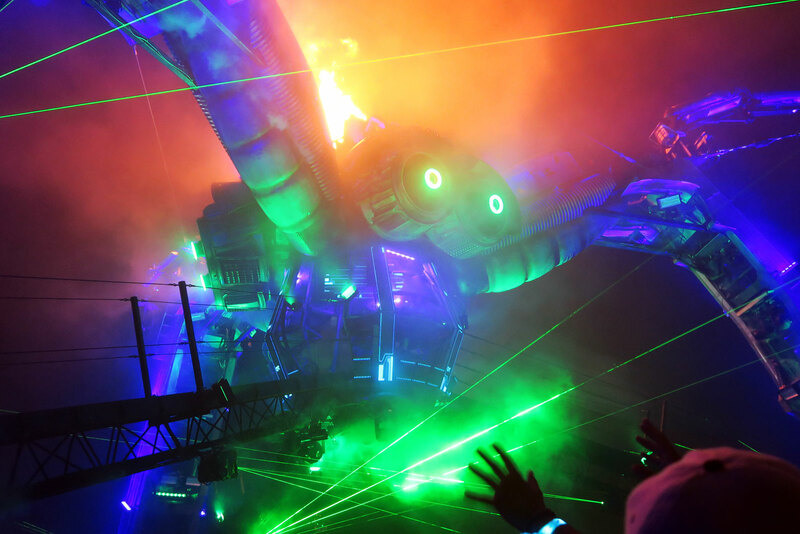 The awe inspiring, fire spouting, metallic spider appears at other festivals and events around the world but there is no place where it is more at home than Glastonbury. When Arcadia first descended on Worthy Farm it changed the way people enjoyed music; rather than all stand facing the DJ, they surrounded the spider and partied in 360 degrees which allowed for an atmosphere that was way more sociable than had ben previously available. People could look all around and see others dancing and enjoying the music just as much as they are. Of course, the theatrics and pyrotechnics are also a huge draw at Arcadia, as is the impeccable sound. It’s a winner on all counts and has become an intrinsic of Glastonbury’s set up every year. This one is a special place based on Alice In Wonderland. Now there is a stage here where some people may be happy enough to spend some time but the real fun is to be had with the immersive series of tunnels located right by the Rabbit Hole stage. It’s quite a well-known spot now so there may well be queues at the entrance but stick it out and make sure you have at least one full go at it. Inside you’ll be confronted by characters from the book who test you with questions before sending you on your way (if you get the answer right). What’s the final destination? Well, that’s for you to find out. One thing is for sure, you will have an absolute riot trying to find out and be rewarded with an experience that very few people at Glastonbury get to go through. Though it has the appearance of a monument that’s been around for thousands of years, like nearby relic Stonehenge, the Stone Circle at Glastonbury was actually put together in 1992. Even so it has a very strong pull and attracts an assorted cast of festival-goers over the event’s entire duration. From older "squares" trying to get hold of illicit substances, to Earth mothers and spiritually abundant individuals singing for peace the Stone Circle attracts them all. In 2015 the Dalai Lama appeared at the Stone Circle to give a speech promoting peace and unity. Though it’s only 25 years old there is a special energy that emanates from the Stone Circle and it’s there where many of Glastonbury’s revellers end up after a long night, watching the sun come up and enjoying the company of their fellow human beings, no matter what their background. If you’re itching for an excuse to get naked but are worried that doing in the middle of headline set at the Pyramid Stage might not be well received then Lost Horizon should satisfy your needs. 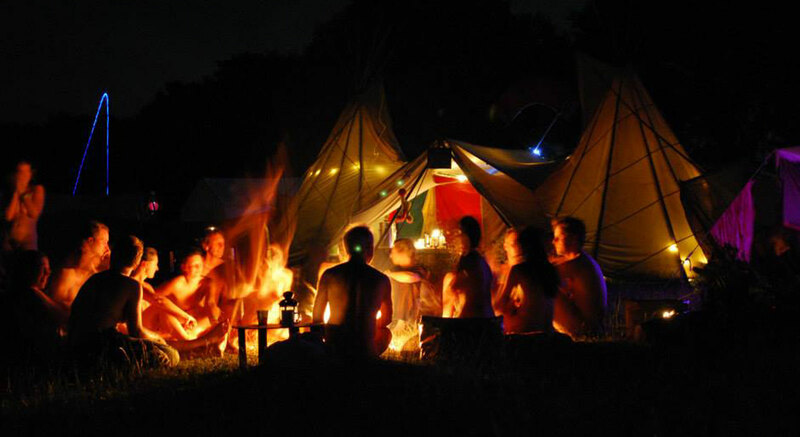 It’s a secluded area where you can strip off, relax and join an array of spiritually inclined peeps in shedding some of the societal shackles that exist even at Glastonbury. Just a few minutes in the sauna will have you feeling open, free and at peace with yourself.